Mayor Ernie Troiano Jr. of Wildwood, New Jersey, isn’t ready to condemn the cop who was recorded on video repeatedly punching a woman on the beach over Memorial Day weekend. 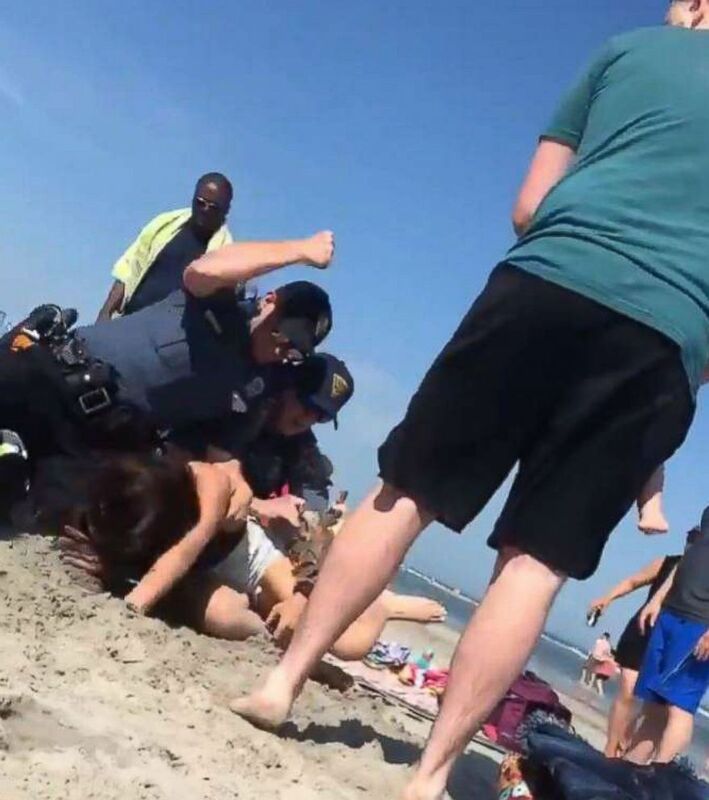 Fellow beachgoer Alexis Hewitt, 19, captured on video multiple uniformed Wildwood Police Department officers attempting to subdue the woman. The footage was posted online Saturday at around 4 p.m.
Later identified as Emily Weinman, she can be seen in the video flailing her arms and legs in a one-piece black swimsuit and jean shorts. The two cops, who were fit with body cameras, wrestled the 20-year-old from Philadelphia to the sand and one can be seen throwing three punches with his right fist down onto her head, while another pins her legs. 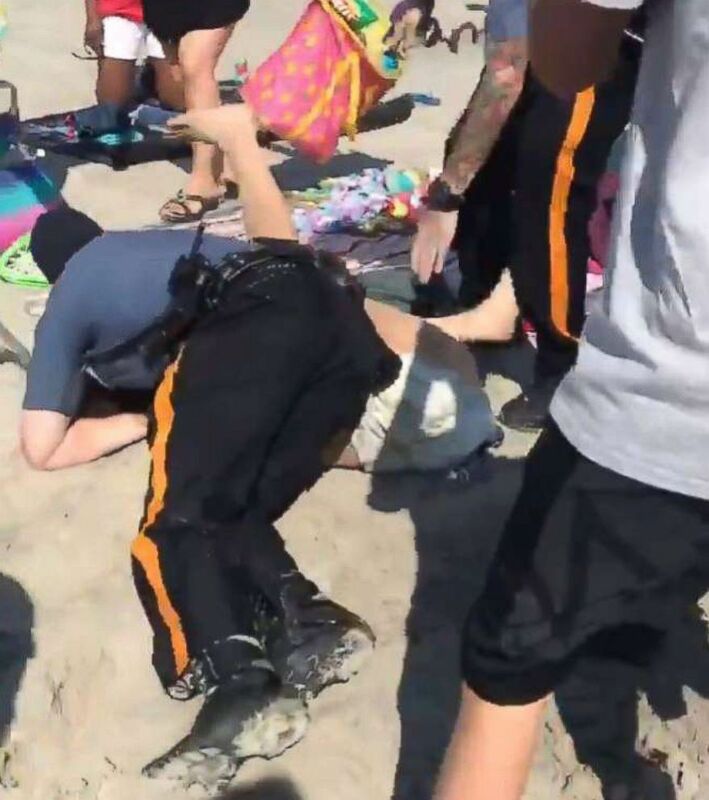 A video made its rounds on social media showing police officers wrestling a woman to the ground and punching her in the head at a beach in Wildwood, N.J., May 26, 2018. Weinman was charged with aggravated assault on a police officer, aggravated assault by spitting bodily fluids at/on a police officer, disorderly conduct, resisting arrest, obstruction, and possession of alcohol by a minor. The officers in the video remain unidentified and were put on restrictive duty while the matter is being internally investigated, police officials confirmed. But the mayor said the hiring of the officers and their sweeps along the beach were part of a coordinated effort to deal with the swelling crowds and to crack down on illicit drinking. He noted that the law must be respected. The mayor believes the incident could have been avoided if Weinman had only complied to show her identification. Even if Weinman wasn’t intoxicated, she had no right to “kick” or “spit” on the officers, he said. “All she had to do was give her ID and this would have been a non-entity,” he added. Troiano also praised the training of the cops, who are “class II, special part-time police officers” hired on for the summer months to deal with heavy tourism. “These officers are trained,” he assured, noting that they undergo a rigorous 26-week “live-in” boot camp training at Cape May County Police Academy. Wildwood Police Chief Robert Regalbuto also backed his seasonal officers’ training in an interview with ABC News Monday. “We hire a lot of officers that help us out in the summertime,” Regalbuto said. “They might not have as much experience as some of the other guys, [but] we do our best with those officers, we do our best to train them properly. Regalbuto acknowledged to ABC-owned station WPVI-TV in Philadelphia that investigators are still piecing together what happened before Hewitt started recording the arrest. The body camera footage remains under scrutiny by the Cape May County Prosecutor’s Office and won’t be released until they complete their probe. “Once the initial investigation is completed by the Wildwood Police Department’s Internal Affairs Unit, the police video will be released to the general public and a more formal statement will be made by our office,” Cape May Prosecutor Jeffrey H. Sutherland said in a statement. Retired New York Police Department Chief of Detectives and ABC News analyst Robert Boyce evaluated the video of Weinman’s arrest. “The correct amount is the least force necessary,” Boyce said. Punches should only be thrown “when you’re under attack in a situation or someone is attacking and punching you,” he said. With Weinman’s arrest, the video shows she was already on the sand and so punches likely could have been excessive. However, not every law enforcement officer can remain perfectly composed in every scenario, according to Boyce. “When you’re in a situation, you’re hyped up and adrenaline is flowing,” he explained. Any arrest, no matter the size or gender, is difficult if the person resists, Cohen explained. “From experience, I can tell you whether it involves a 240-pound man or a 110-pound woman — it is very difficult to place somebody in handcuffs who doesn’t want to be in handcuffs or is battling the officer,” he said. He added that the internal investigation into how the arrest escalated into a melee will zero in on an array of factors, including what transpired before Weinman was punched, if the force applied was warranted, and were the cops properly trained.